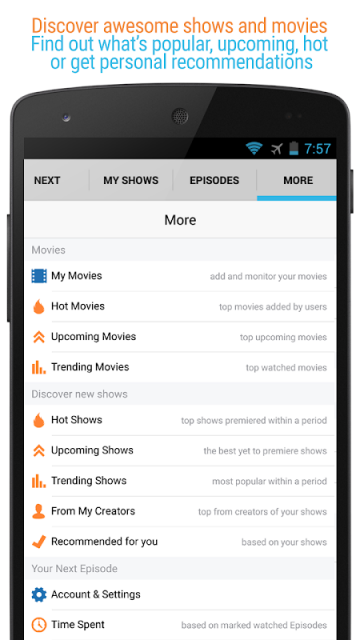 Easily track TV shows and the Movies you watch and discover new - great ones that YOU'll like! Clean interface, useful and unique features and a joy to use - this is Next Episode! Tens of thousands of people are using this app daily and are giving it great rating - check it out to see why - if you need to easily keep track of your TV shows and Movies - this is the app for you. 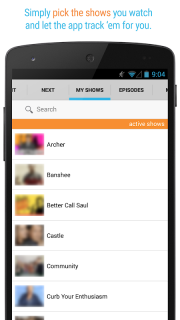 MY SHOWS - add your favorite series, and Next Episode will track them for you. MY MOVIES - add your favorite movies, and Next Episode will track them for you. RECENT - see what shows just aired and what is coming tomorrow. See all the shows or just the ones you follow. 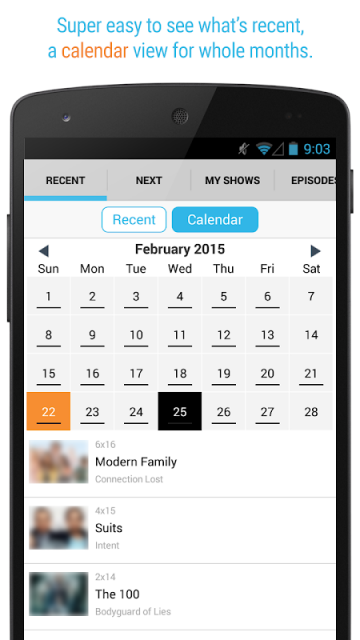 CALENDAR - a calendar view, again - filled with all the shows or just the ones you watch. 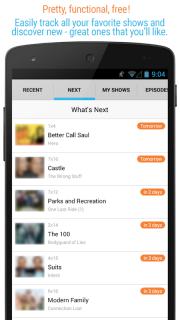 WHAT'S NEXT - the TV shows from MY SHOWS with a countdown, ordered by when their next episode will be aired. EPISODES - new episodes from MY SHOWS appear in there once they air. A great way to keep track of all unwatched (or not downloaded yet) episodes! - HOT SHOWS / MOVIES - see which were the most popular recently premiered TV shows and Movies, and find something new to watch! - UPCOMING SHOWS / MOVIES - the best shows and Movies to premiere soon. 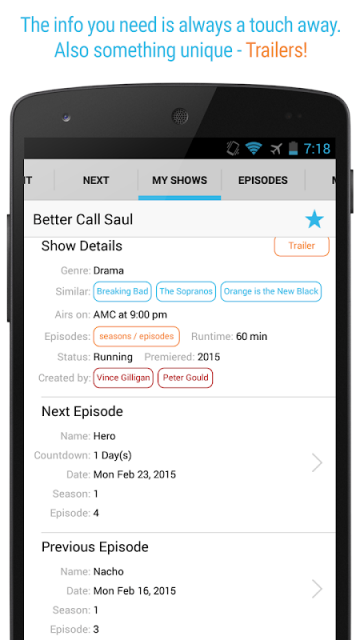 Sortable by premiering season or anticipation! 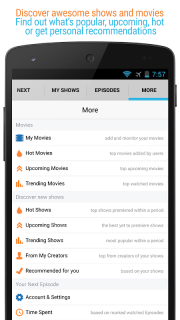 - TRENDING SHOWS / MOVIES - see all time top TV shows and Movies or popular within a time period! - FROM MY CREATORS - great shows by the people who created the shows you already watch. - RECOMMENDED SHOWS / MOVIES - get personalized TV and Movies recommendations based on the shows and movies you already watch. SHOW DETAILS - See more about the TV series. A picture, short description, channel, duration, trailer, next/previous episode info, seasons/episodes schedule with episodes summaries and air dates etc. TRAILERS - check out TV shows trailers and easily discover great series that you'll like. 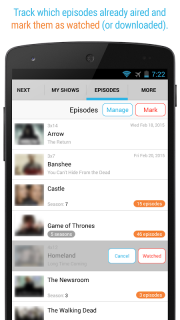 A unique functionality that only Next Episode has! 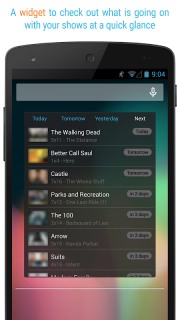 WIDGET - see what's recent and what's next from your shows in a quick glance. 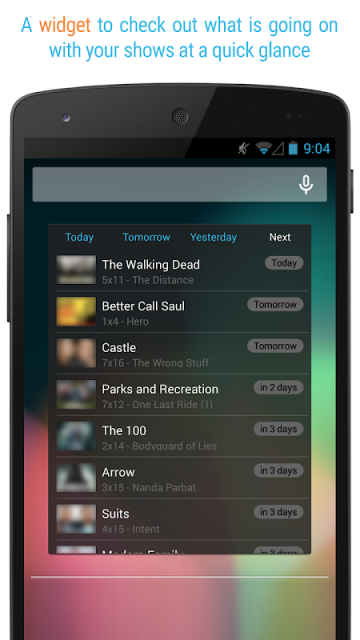 PUSH NOTIFICATIONS - get a notification for upcoming episodes, released movies, whenever a show you watch is cancelled/ended (or resurrected), got a premiere date for a new season etc. PAUSE TRACKING - you can pause the tv show tracking per show, which effectively hides a show from the app, but keeps it in MY SHOWS and remembers its watched episodes. TIME SPENT - check out how much time you have spent watching your TV series! Take a look at the screenshots and the great rating that our users give us - and start using Next Episode to track your shows and movies today! 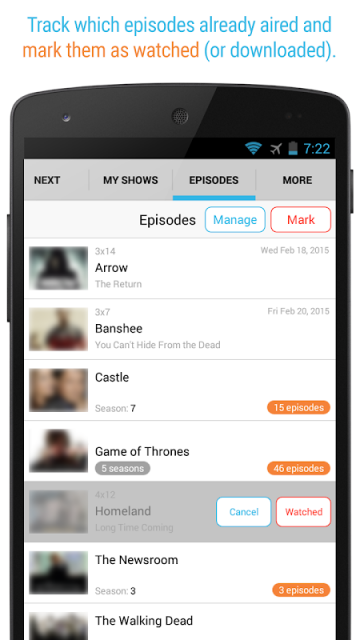 - "Photos/Media/Files" permission is required in order to cache the in-app and widget TV show images. Next Episode is powered by http://next-episode.net. All rights reserved.